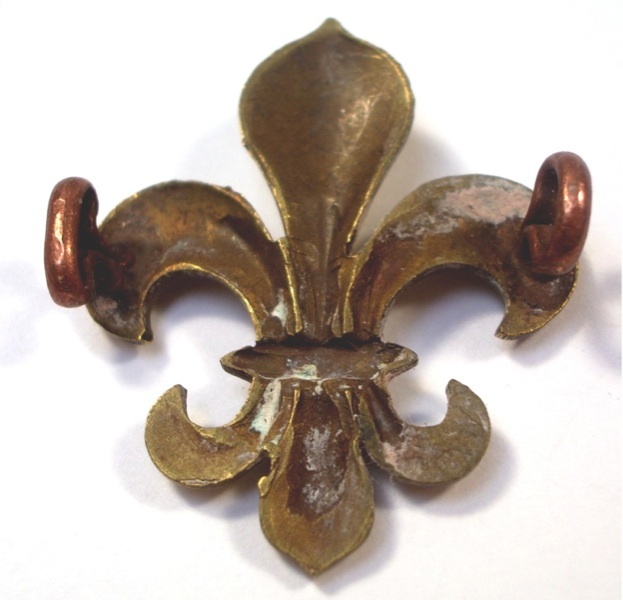 This is an original military collar badge from the Manchester Regiment. 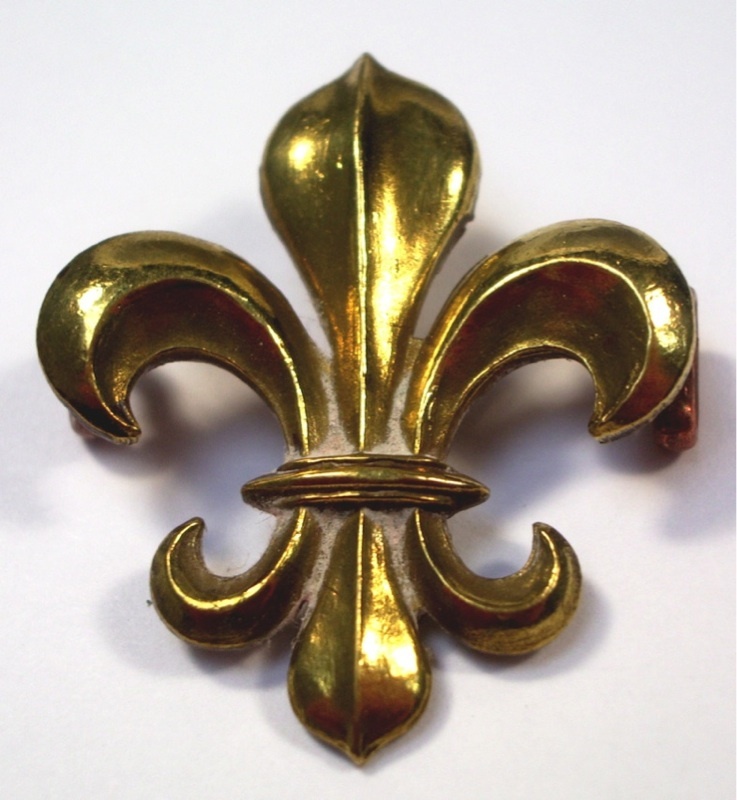 It is in the style of fleur-de-lis or flower of lily, a stylised lily, made by Marples & Beasley of Birmingham post 1923. 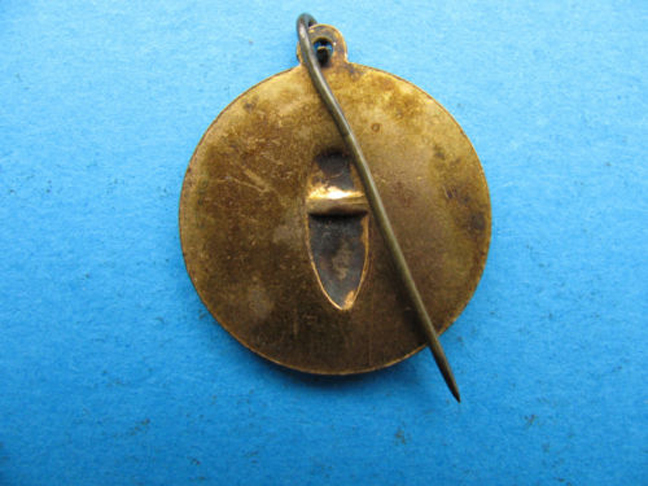 The collar badge measures 3.2 cm in length. 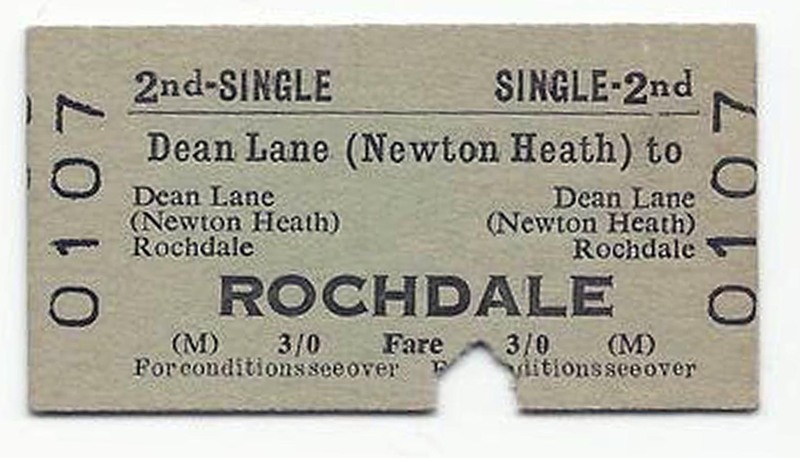 BR ticket Dean Lane Newton Heath to Rochdale dated 7 Jan 1969. Courtesy D. Boothman. This is a 2nd class single British Rail train ticket from Dean Lane Station in Newton Heath to Rochdale, dated 7th January 1969. Dean Lane Station was opened on the 17th May 1880 by the Lancashire and Yorkshire Railway (LYR), providing a direct link to Oldham and Rochdale. Dean Lane Station finally closed on the 3rd October 2009, although the original station had disappeared by 1977. Dean Lane Station is due to reopen in 2012 as part of the inner city Metrolink transport system. Manchester Civic Week – Commemorative Badge – 1926. This is a bronze commemorative badge for the inaugural Manchester Civic Week week took place from the Saturday 2nd to the Saturday 9th October 1926. The badge has the emblem of Manchester on the front of it, the worker bee, which symblised Manchester as the hive of activity during the 19th century, when industry within the city was at its height. 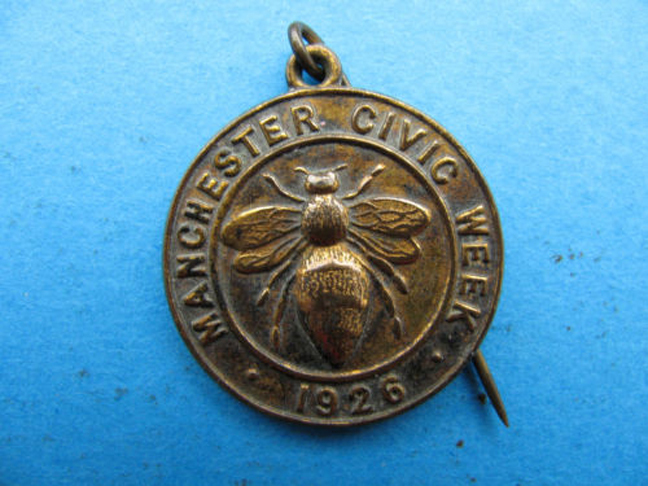 The badge is inscribed with ‘Manchester Civic Week 1926’. There is no makers mark. Manchester Bus ClipperCard from 1991. Courtesy D. Boothman. This is a Manchester bus service ClipperCard from 1991, which was launched in December 1979 by Greater Manchester Transport. 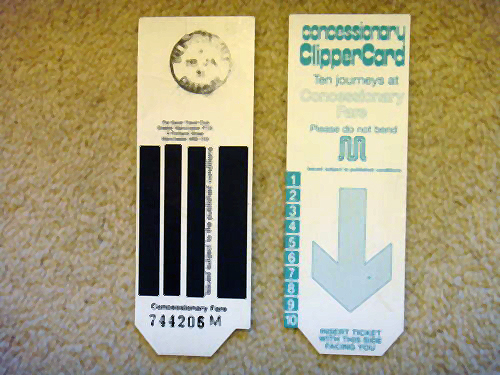 The Clippercard offered 10 bus journeys for the price of 9, which the traveller would ‘clip-off’ in the self-cancelling machines which were installed on every bus. The expansion of the school bus network also led to the demise of the ClipperCards, coupled with a great shift for children to be driven to school by their parents, rather than using the bus service or indeed walking. The forced break-up of GM Buses by the Conservative Government in the 1990s also impacted greatly on the ClipperCard, as the UK Government wanted to streamline the system and essentially make more money from the bus services and so implemented their long held belief that privatisation rather than public ownership was the way forward. 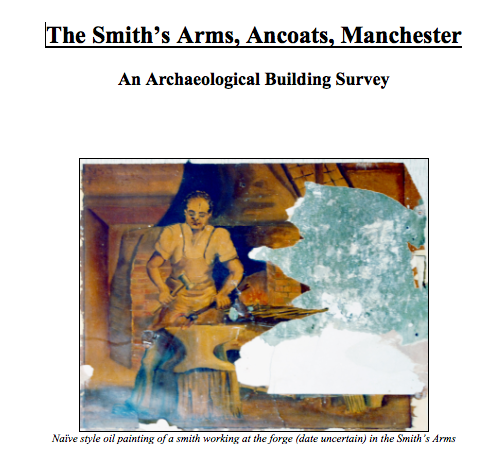 This the archaeological survey untaken by Manchester University in July 2007 for the historic and soon to be demolished The Smith Arms Public House in Ancoats, which sadly since 2005 has been waiting its fate, which sadly is nearing ever closer. Yet another historic building lost forever in an area that in 1999 applied for Unesco World Heritage Site status, submitted by the Department For Culture, Media and Sport Buildings, Monuments and Sites. Galloways Paten Compound Engine - 1879. 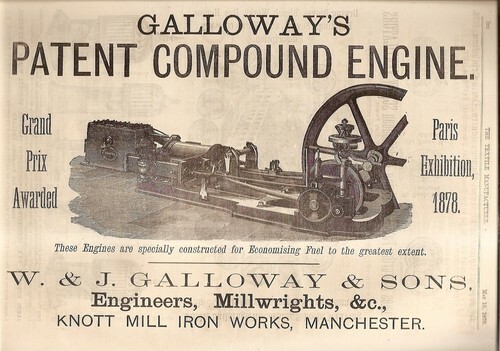 This is an advert for Galloway’s Patent Compound Engine made by W.J. Galloway & Sons in 1879, who were a engineering and millwright company based at Knott Mill Iron Works which was located in Hulme, Manchester. 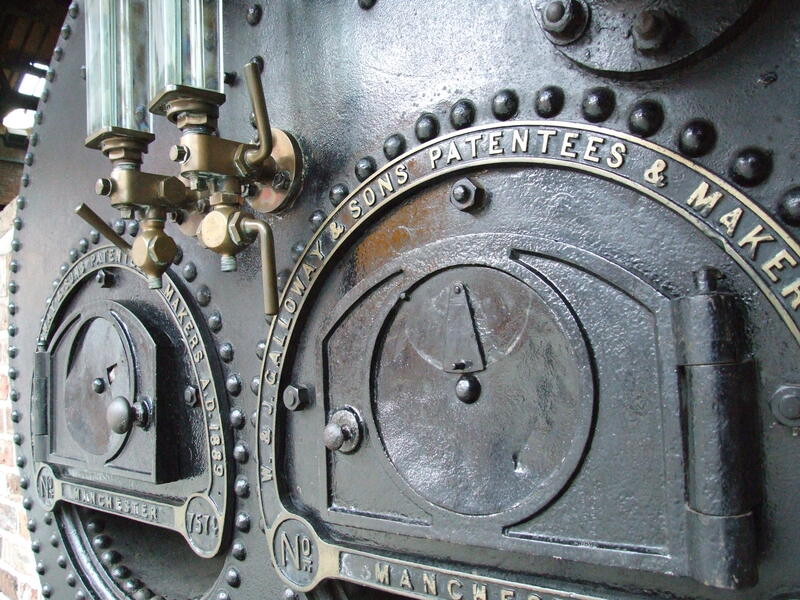 The company was originally founded as a partnership of two brothers, William and John Galloway in 1835 and were manufacturers of steam engines and boilers until they went into receivership in 1932. A W & J Galloway & Sons cross compound engine as seen at the Museum of Science and Industry in 2011. Malcolm Ross & Sons paper fabric label measures 11.43cm x 8.89cm & 10.16cm x 7.62cm. Image courtesy D. Holt. 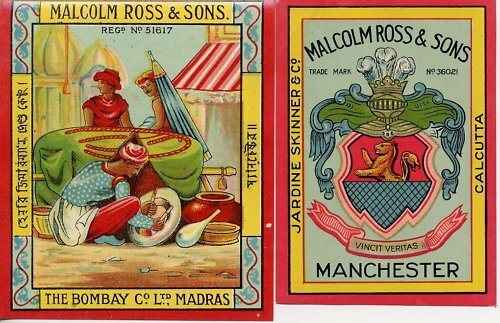 These a two Malcolm Ross & Sons paper fabric labels which were recovered from a bonded warehouse in the centre of Manchester in the early 1980s when the textile industry was in decline and many of the warehouses were being demolished. The exact date of the labels is unknown but the family run Malcolm Ross & Sons is still trading after originally being established in 1834 and is now based in Alderley Edge, Cheshire , specialising in the field of technical textiles, supplying a broad base of technical materials such as a filament yarn, monofilaments, fibrillated yarn, teabag thread, nylon cords, cotton & viscose string, medical thread, ripcord yarn and identification threads. The labels have written on them Jardine Skinner & Co which refers to the Jardine Skinner & Co Trading Company established in Calcutta, India in 1844 by David Jardine of Balgray and were major traders in tea, jute rubber. The labels also have written on them The Bombay Co Ltd which refers to a company which was founded in 1886 when the Bombay Burmah Trading Corporation Limited was transferred and subsequently changed its name having originally started life in Bombay, India as Frith and Company then becoming Wallace and Company in 1848 by founders Lewis Alexander Wallace and Framji Patel. The latin inscription on the coat of arms ‘vincit veritas’ is latin for ‘truth conquers’. Biscuit tin and lid. Courtesy L. Gregory. 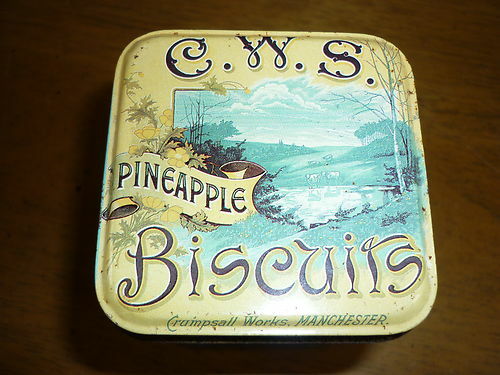 This is a pineapple biscuit tin from Crumpsall Biscuit Works which opened in Lower Crumpsall, Manchester in 1873 and finally closed in 1986. 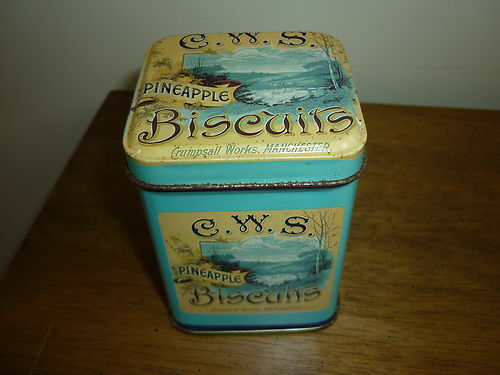 The biscuit tin measure approximately 8.89cm x 6.35cm and as the Co-operative Wholesale Society (C.W.S) on the lid and side of the tin. Co-operation and ‘working together for the good of all’, were the mottos of the Co-operative Wholesale Society, where a strategy was in place by which members would share the profits of the people’ store in the form of cash dividends at set times of the year. Biscuit tin lid detail. Courtesy L. Gregory. This is the first England cap awarded to Collyhurst footballing legend and one of the game’s most colourful characters, Stanley ‘Stan’ Bowles. 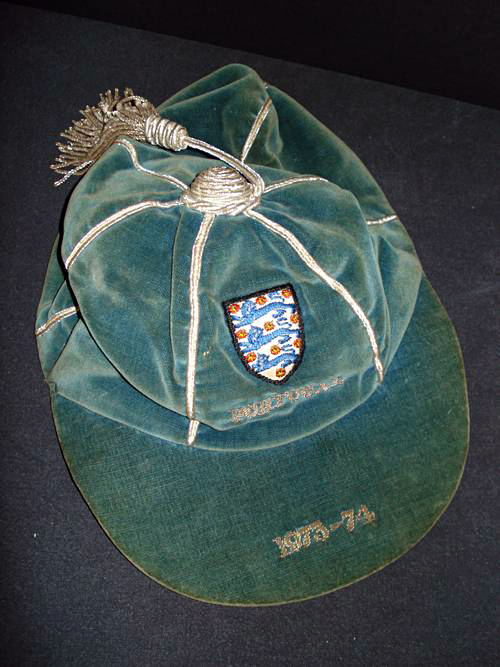 Bowles won the cap on his debut game for England v Portugal in April 1974 at the Portuguese national stadium in Lisbon, the Stadium of Light (Estádio da Luz). The game ended 0-0, and would put Bowles briefly on the international stage. Unbeknown to many, although not to be unexpected in an era when English caps weren’t given out like confetti, the relationship like much of Bowles’ life, would not an endearing long held love affair. Overall he only won five caps for England, although widely regarded as one of the most talented football players of his generation. Some said, second only to George Best. 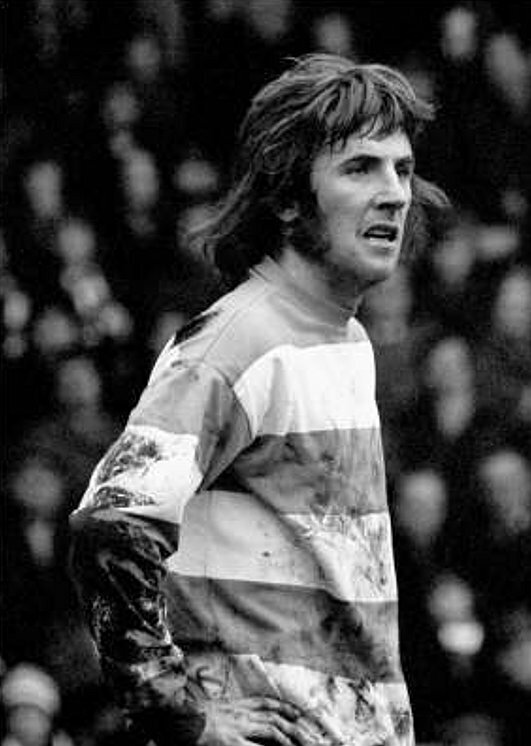 Stan Bowles playing for QPR in 1974. Courtesy S. Bowles. 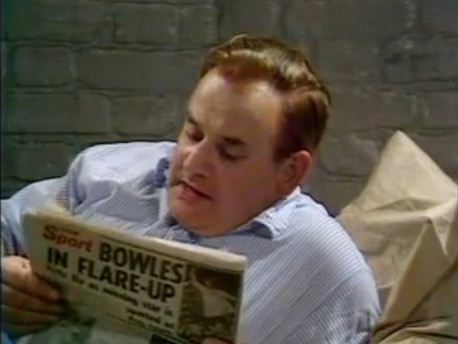 Bowles was considered to be one of the most entertaining sport personalities of the 1970s, with his skill on the pitch only matched by his ability to court the headlines off it. Often appearing on the front pages of the tabloids as much as he was on the back. Provoking the unwanted attention of those in authority seemed an occupational hazard for Bowles, whose greater focus lay in entertaining the crowd. Sentiment lost on the majority of modern football players whose only concern it appears is promoting themselves. Bowles’ unique combination of talent, self-confidence, charisma and maverick style has meant that in almost 30 years since he last kicked a ball, his many exploits are still the subject of much pub banter from fans who were fortunate to have seen him play or those who can only dream of having his undoubted skill. The cap is a light green velvet 6 panel cap with silver braid and tassle with the English Football Association badge to the front with ‘Portugal‘ underneath. It has 1973-74 on the peak. Polish keeper Jan Tomaszewski makes one of the many saves to deny England. Tomaszewski would later become known as “The Man That Stopped England”. Courtesy S. Bowles. Bowles’ first game for the national team would be most notable as it would become that last game that 1966 World Cup-winning manager Sir Alf Ramsey was in charge, as England failed to qualify for the 1974 World Cup in West Germany, following only 1 win out of 4 in a group that included Wales and was topped by Poland who got 1 -1 draw at Wembley. Ramsey’s England fate was sealed prior to the Portugal game following a defeat to Italy in which ex-England manager Fabio Capello scored. Bowles would only score once for England in a win against Wales (2-0) at Cardiff City’s Ninian Park in Leckwith, Cardiff on the 11 May 1974. 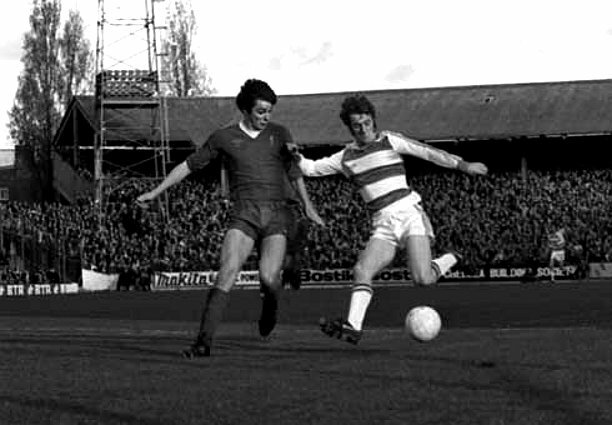 Stan Bowles in action for QPR taking on Liverpool’s Alan Hansen in 1977. Courtesy S. Bowles. Bowles enjoyed a long career from his professional debut for Manchester City in 1967, to Bury Football Club, Crewe Alexandra, Carlisle United, his notable career at Queens Park Rangers (In 2004, a fans poll saw Bowles voted QPR’s greatest player of all time) ; playing for Brian Clough’s and Peter Taylor’s 1979 European Cup winning Nottingham Forest side and earning a medal on his debut against Barcelona at the Nou Camp. Bowles later had a spell at Leyton Orient, before retiring in 1984 at Brentford Football Club . Protractor made by J. Halden & Co. Ltd. Image courtesy S. Mir. 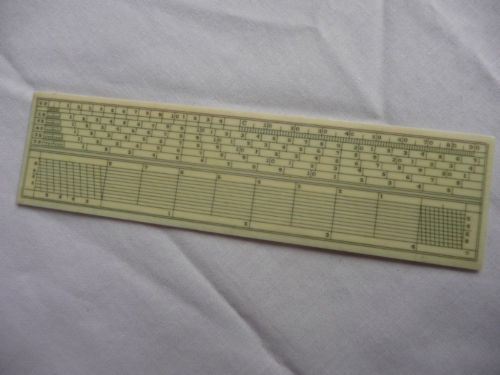 This is a ivory protractor made by J. Halden & Co. Ltd. who were based at 8 Albert Square, Manchester. J. Halden & Co. Ltd were producers of a range of drawing and surveying instruments and other office materials and had offices in London, Newcastle-upon-Tyne, Birmingham, Glasgow, Leeds, with their manufacturing base at Rowsley Works in Reddish, Stockport. 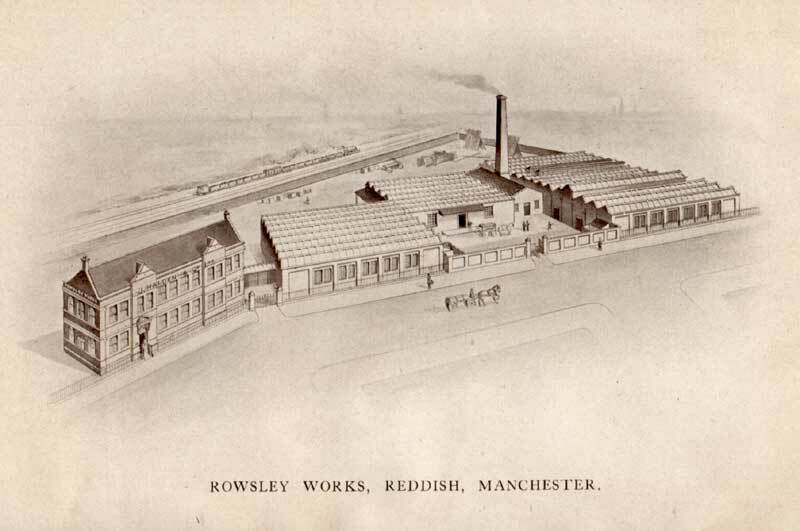 J. Halden & Co’s Rowsley Works in Reddish. Image courtesy P. Stanley. The business was started by Joseph Halden in partnership with A.G. Thornton in 1878 as a wholesale drawing material importer and mounting paper manufacturer. However, by the 1880s, A.G. Thornton had left the business and moved to his own premises which were based on Deansgate.By 1889, the business was established and making sufficient profit for Joseph Halden to purchase manufacturing works on East Street, just off Lower Mosley Street. By 1892, it is possible that Joseph Haldens son had taken over the running of the business after his retirement to Southport. 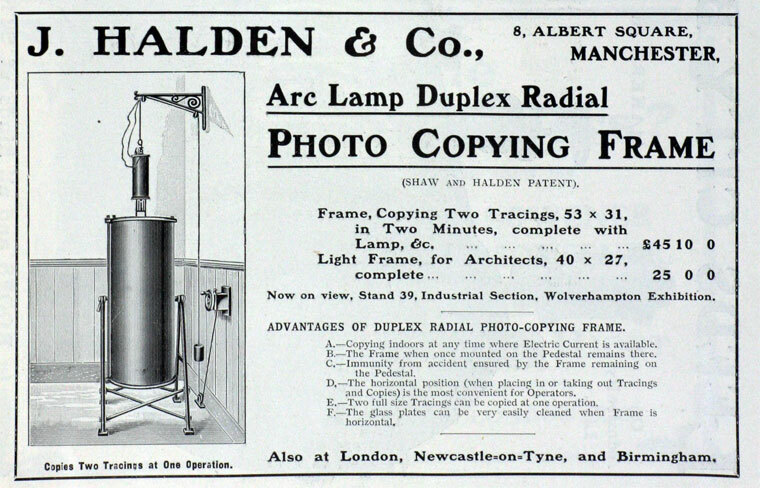 J. Halden & Co photocopying frame in 1902. Image courtesy P. Stanley. Newcastle, and Birmingham, whilst acquiring additional works in Lund Street, Cornbrook in 1900 and warehousing on Altrincham Street, off London Road, in 1903. They also purchased additional premises at 37 Brazenose Street, next door to their Albert Square headquarters. In 1907 they became a limited company and by 1908 they had built their new manufacturing base in Reddish following a fire which destroyed their Cornbrook works. The sheer scale of the new premises meant they could offload the warehousing on Altrincham Street. By the start of the World War One in 1914 they had established themselves as specialist in providing drawing materials and instruments and photocopying machines and services for engineers and architects. By 1920 they had added offices in Glasgow and Leeds to their growing business. In the 1930s, J. Halden & Co. Ltd purchased further premises at 25 Brazenose Street to house the expanding photocopying business and it was here that many new patents for photographic apparatus, photosensitive materials, blueprint processes and photocopying machines were born. In the 1940s the business continued to expand and prosper under the guidance and leadership of Jospeh Halden’s grandson, John Lionel Halden, who became the technical director of the company. It was at this time that a further extension to the Reddish Works was completed to include an enlarged engineering department for the production of photocopying machines and added space for the storage of office supplies. Following John Lionel Halden’s death in August 1965 at the age of 49, having only a year before becoming the chairman, the company was steered by managers until it was finally taken over in 1969 by the Ozalid Group, which was started as part of the German company Kalle in 1928. The subsequent take over resulted 13 days later of the closure of the Reddish works with the loss of 75 jobs with the engineering work being transferred to Block & Anderson‘s works at Aycliffe, Co. Durham. 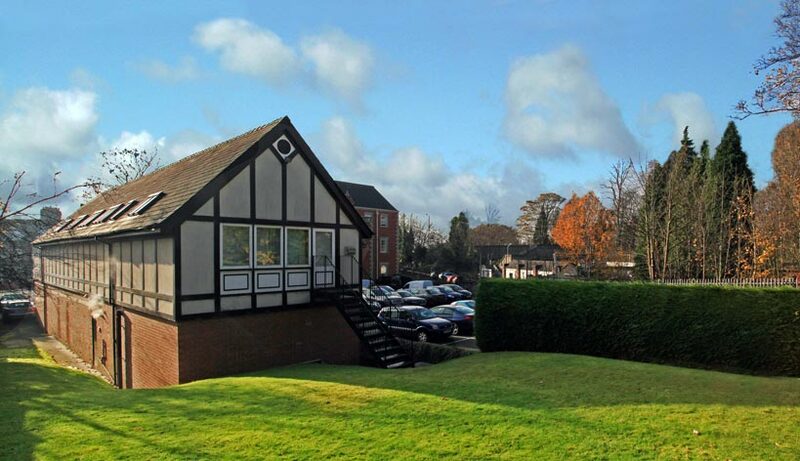 A small number of employees were kept on at the Manchester branch office, whilst others were offered jobs with other members of the Ozalid Group.